There was such a nice response to my last soup recipe I thought I’d share another. Heck, it may become a regular feature. 1. I don’t make food from scratch unless it’s easy. That means simple, no fancy techniques or equipment, and fairly fast. 2. 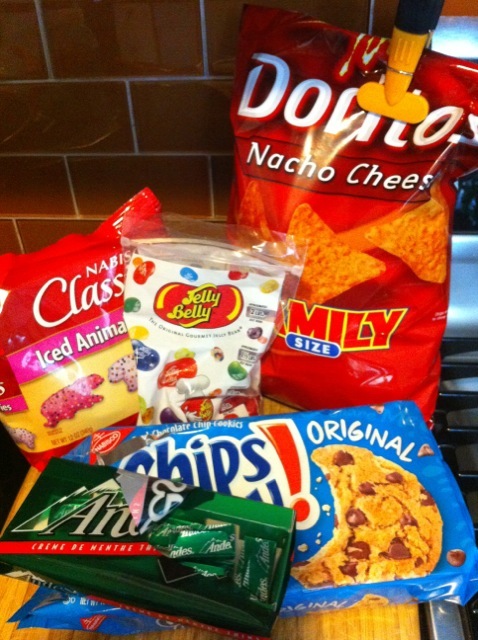 If there isn’t something healthy in the house, I’ll resort to what my husband eats. Too bad we’re out of Pop Tarts. That would have rounded out the photo nicely. 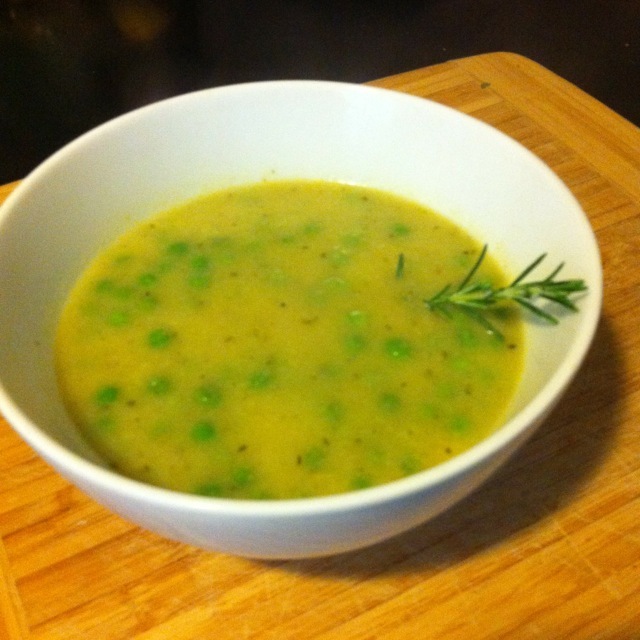 This recipe for cauliflower and pea soup is such a snap it’s a crime. I unloaded the dishwasher and rinsed some strawberries to freeze in the time it took to make it. Chop up the onion and saute in a stockpot with olive oil until golden. Add 2 cups water, a vegetable bullion cube (or just use broth) and both bags of cauliflower. Add spices—I used the rosemary (stem and all) as well as some ground coriander and a little turmeric. Cover and bring to boil, then simmer until cauliflower is soft. Blend. Okay, I know I said no fancy tools. And you can use a regular hand mixer or a blender (leave pressure valve open on lid!!). But this hand blender has been totally worth the $49.95 in convenience. And it comes with bonus chopper attachment. Once you have your base blended, add the two bags of peas. 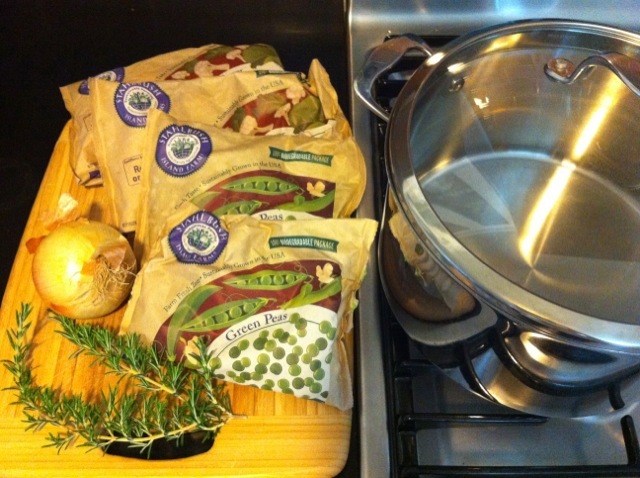 Cover and bring to simmer, cook until peas are soft (8-10 minutes). *Garnish is for show only. I’ve never garnished before. Maybe I’m growing. Let me know if you make it, what you think, and if you have a favorite recipe! I need one of those blender magic wands. I have made this about a half dozen times since you shared the recipe with me, and every time it is so delicious, and truly easy. Now I want a Dorito. @mads – you crack me up! I am buying an immersion blender TODAY. or tomorrow. looking for recommendations… if you like yours, what is the model? fun! are you making soups too? im more of a smoothie fanatic. esp this time of year. What a great recipe, and your comment about the garnish made me giggle. Unfortunately, I don’t have any fancy gizmos like that so I’ll be missing out on this tasty soup. Here is one of my favorite recipes that we talked about the other day. 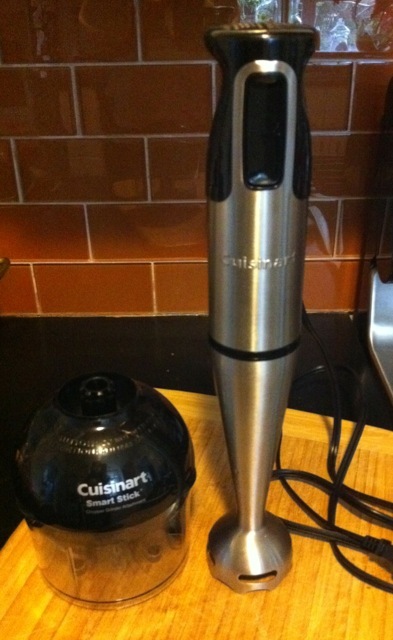 love the recipe, love the cuisnart wand and yes.. if it’s not fast and furious i’m not in. great post. @nancy – thank goodness *i’m* not the only one!! (this is like yogi-confession-anonymous). Speaking of Doritos .. which perhaps we weren’t, but now they are on my mind .. Kettle Chips has a Ranch flavor that tastes just like Cool Ranch Doritos (which I loved but didn’t buy). And at the same time I discovered them, I learned that Kettle Chips are local. I suspect there will be lots more chips in my future. I think we were speaking of doritos, e! :) good to know about kettle. LOVE the cool ranch. good tip. I’m making this tonight. I sauteed the onion with 1 Tbs of curry powder, little salt and pepper to really get the flavors going. And added the cauliflower to the mix before adding the broth. I threw in some leftover ham from Easter and a big big bunch of chopped kale–because you can never have enough leafy greens. Needed a bit more broth, but tastes lovely! One thing I’d change to my version. Boil the kale with the cauliflower and add more broth to make up for added veg. Then blend it all together. It would help keep the smooth texture of the soup while still upping the ante of the leafy green goodness. I cook all the time and it’s fancy baby. I have a sneaking suspicion that the extra 20 pounds I’ve gained in the past year or so is from all these rich, savory, meaty, chocolatey, creamy, buttery goodies coming from my kitchen. Do I have a favorite. Yeah, variety. I love it all and it’s fun to share in the experience of menu planning, shopping, cooking and eating with my sweet Tony who loves it too. Keep up the great work Michelle. Just some handy tools, techniques and desire are all it takes to crank out the yummers. Are you sure our husbands are not related? Although my picture would have had to include bacon. Can’t wait to try the recipe!